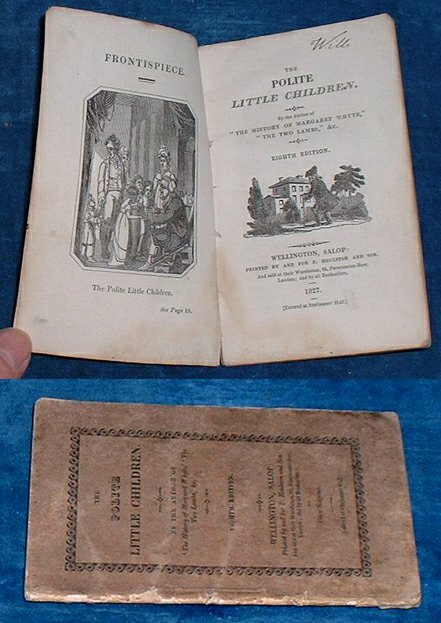 Title: THE POLITE LITTLE CHILDREN By the author of "The history of Margaret Whyte," "The two lambs," &c. Eighth edition. Description: Wellington, Salop, F. Houlston & Son 1827 Engraved plates (6) + Titlepage vignette. . Duodecimo lettered card covers in printer's ornament frame lower cover with list of Cameron titles (spine surface bit worn) 36pp with plates within the page count. Name Wills to margin of title, light pencil notes on rear pastedown else very crisp and clean.